A weekly newspaper has been praised for helping to “save lives” after launching a campaign to rid its patch of cocaine. The Accrington Observer launched its ‘Killer Cocaine: Stop the Deaths’ campaign after discovering that 17 people had died as a result of using the drug on its patch in recent months. 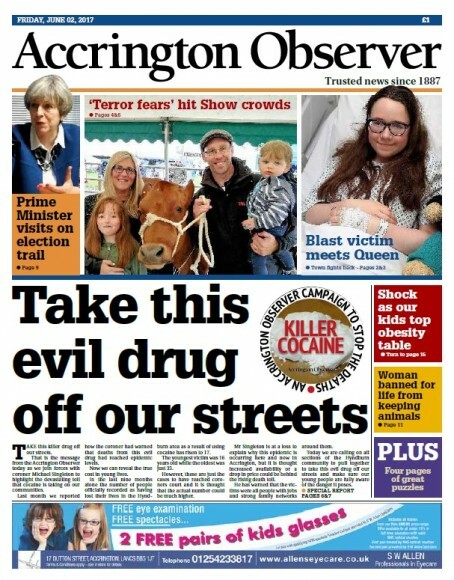 The Observer has joined forces with East Lancashire coroner Michael Singleton for the campaign, with the aim of publicising the dangers of cocaine use and growing problems with the drug in the Accrington area. The paper has published a six-point guide to show readers how they can join the fight against the killer drug by speaking to relatives about the risks, spotting the early signs of drug use, offering support to addicts and reporting suspicious behaviour to the police. Observer editor Gareth Tidman said: “Many people see cocaine as a party drug, something that it is a bit of fun to do on the weekend, but this astonishing number of deaths tells a different story. “We felt it was important to get across just how dangerous it can be to make people think twice about using it. “There is real human tragedy behind this campaign. As the coroner said, if all of these people had died together at the same place at the same time it would be international news. The coroner says that in all the cases he has dealt with the victims, who have all been aged between 16 and 33, have been people in employment with strong family networks around them. Since it was launched earlier this month, the campaign has revealed how the cocaine trade has led to a surge in drug-related violence on the streets of the borough of Hyndburn, how many of the area’s pubs are being flooded with the drug and how landlords are struggling to deal with the problem. The Observer has also run exclusives on how youths as young as 14 are known to be experimenting with the drug and how it can be delivered to your door in just ten minutes from a phone order being placed. Hyndburn MP Graham Jones said: “The drug dealers behind it are quite happy to wield machetes. They are not bothered if the drugs they cut are laced with chemicals that put someone’s life at risk, they are not bothered about anyone losing their lives as a result of these drugs.